According to a new interview with Famous Monsters, James Cameron is unlikely to return for another Alien film. I know it probably goes without saying at this point but I’m sure it’s something that a lot of fans would still be eager to see. Cameron made the comment in a new interview with Famous Monsters as part of the various 30th anniversary (today!) celebrations. 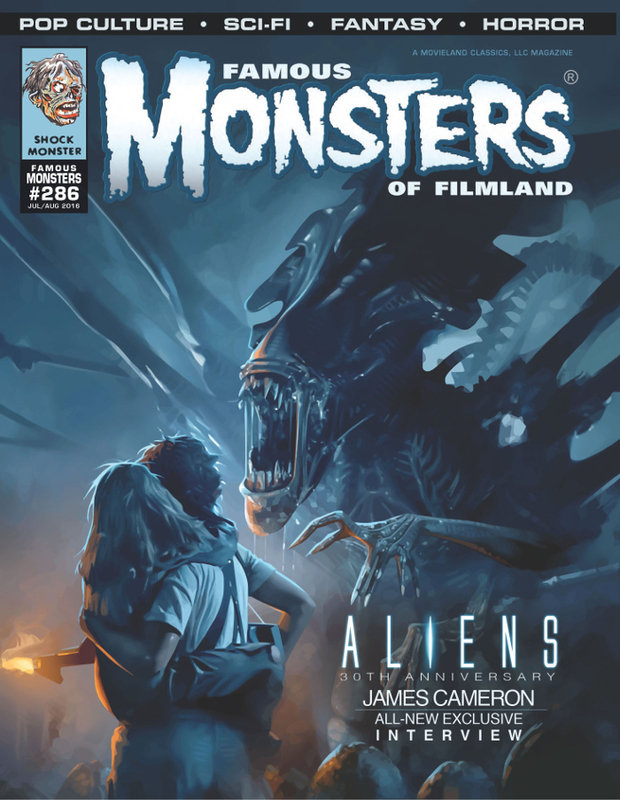 The 286th issue of the magazine features a brand new interview conducted with James Cameron. A half hour segment of that interview with editor David Weiner was released as their 12th podcast and you can hear Cameron making the remark at around 28 minute mark. James Cameron unlikely to return for another Alien film. The comment comes from issue #286 of Famous Monsters. With another 3 Avatar films planned, Cameron’s slate looks to be occupied by the science-fiction series for some time to come. The last time Cameron was seriously involved in returning to an Alien film was back in the early 00’s when both he and Ridley Scott had been working on a concept for Alien 5. Cameron ultimately dropped work on the project when he found out Fox were moving forward with Paul Anderson’s Alien vs. Predator. Thanks to Omega Underground for the news. I'm happy with the way history has turned out. I agree with your list and order! But not necessarily the content. It's not rocket science! why on Earth didn't this happen! If only the FOX suits had let Ridley & Cameron do their joint version FIRST, and then greenlit their AvP project afterwards. The fools. I've always wondered what we could have ended up with between the two of them collaborating. Fox had no idea the pair were working on a project - and Cameron mentioned in an interview, one time, that Scott never bothered to get back in contact with him about it. Seems like Cameron was the one who was mainly trying to get it done, but that he didn't notify Fox about it. There was no indication that Fox would have refused simultaneously filming it, however. Cameron only ever said he decided to stop writing and then, later, regretted doing so, because the AVP project wasn't nearly like he thought it was going to be. From that, it seems like he had never read the initial comic (which is ironic, as the likeness of one of the characters was based upon him), because, before that, he used to say he thought it could only ever turn into a messy 'Godzilla'-style enterprise. This makes me think that, had he been aware the AVP concept was aimed at being on a far smaller scale than he assumed, he might have simply continued with what he had been writing. Not really a big surprise. Why would he make another Alien - a film that would have a hell of a lot to live up to - when he's laughing all the way to the bank with his pet Avatar project? I have to wonder how successful those sequels are actually going to be. Yeah, Avatar was massively successful but I very rarely see people with positive stuff to say about it now-a-days. One also has to consider the foreign exchange rate. Back when avatar was released the us dollar was weak, thus over seas tickets sales had much more monetary power when converted to USD. Today overseas ticket sale receipts are simply worth less money and 3D is not that big of a deal so getting people to pay more will be hard. Avatar likely can not beat a movie like The Force Awakens today. The Irish spell it with an 'e', just get an Irish passport and you'll be fine. You must've had too much whiskey, mate. LOL Whiskey's type gave me a good chuckle. I would love to hear details of the story him and Ridley were working on before Fox started riddling the franchise with Bullets. That's pretty much all there is to find. I ordered mine after posting this. I wasn't a fan of Avatar. It looked pretty enough but I find it overly long and boring. It's been a few years since I rewatched it though. Might give it another try. Than Ripley 8 was a chosen one in the A5 draft? She can control events by dreaming? What if she dream about turn back in time and save Hicks and Newt in some kind of Interstellar way? Maybe that power she will achive in A.Covenant from her mother. Him describing the limitations of technology aloud them to focus on story and character rather than over expose the creatures, that hwy the early films hold up so well. Its a shame James Cameron isn't doing smaller scaled practical effects movies, he's caught up in the Avatar world, that film had alot of hype around it for its renovating effects and 3D experience and it sure made a name for itself breaking 2 billion at the box office, however many movie goers dismiss it for the story being your basic native American vs white invaders Dances with Wolves set in a space epic. "From the directors of Alien, Aliens, Titanic and Gladiator." Throw Arnold in there like James said. Cameron and Scott should've fought harder for Alien 5 back then. Not much they can do without the go ahead from Fox. Fox wanted AvP and that was a deal breaker for both directors. I'm fine with that. No need to overdo it. Ridley Scott should take note. Xan21 - I very much care about the 'Avatar' sequels. And it's 4 not 3. That's a really really great universe (the most creative one I can think of in ages) that the first film set up with a simple story. I really look forward to see where James Cameron takes it with this very ambitious project of shooting 4 films simultaneously. If he's guaranteeing he won't ever be interested, there wouldn't be much harm in him spilling the details on the idea he had been working on. It's still so crazy how much Fox shot themselves in the foot in the early 90's. They DIDN'T want to develop an Alien movie with Ridley and Cameron. WTF!!!!!!! Who was the crazy person running the studio then? This news makes me frown a bit but I can totally understand it. James Cameron knows that he simply cannot out do Aliens. So instead he rather do films about other aliens... that he invented. ha the bugger went George Lucas on us.